In 2018 Turkey's aviation market confirmed its rebound from the setbacks of 2016, when geopolitical and terrorist events had weighed on demand, particularly in international markets. As in 2017, passenger growth outpaced seat growth in 2018, and this was led by the international market. The healthy demand environment was positive for the unit revenues of the country's two leading airlines. Both the flag carrier Turkish Airlines and the ultra LCC Pegasus Airlines reported 2018 operating margins that were their best for some years and, again, very similar to one another. For 2019, Turkey's airport authority DHMI forecasts that passenger traffic growth will be slower than in 2018, but still comfortably above the European average rate. With both the leading airlines apparently locked into the same profit cycle, it seems only the transfer of Turkish Airlines' hub from Atatürk to the new Istanbul Airport (again pushed back, now to 5/6-Apr-2019) could set them on radically separate margin trajectories. That wild card aside, macroeconomic and geopolitical drivers are likely to determine whether or not Turkish Airlines and Pegasus Airlines can achieve further margin improvement this year. Turkey seat growth accelerated once more in 2018. Passenger growth outpaced seat growth, led by the international market. Both Turkish Airlines and Pegasus Airlines reached their highest ever load factor in 2018. For 2019, traffic growth is expected to be slower than in 2018, but still above the European average rate. Turkish Airlines and Pegasus Airlines both reported 2018 operating margins that were their best for some years. The Turkish aviation market increased total seat capacity by 9.3% in 2018, to 165.6 million, according to data from OAG. This growth was an acceleration on the 3.7% growth of 2017 and the 1.6% increase of 2016. However, the double digit growth of the years preceding that is now firmly in the past. In 2018 international capacity outpaced the domestic market, with growth of 11.9% (to 103.4 million international seats) compared with 5.2% (to 62.2 million domestic seats). This was the first time since 2015 that international seat growth had been faster than domestic growth. * The values for this year are not complete and are at least partly predictive. 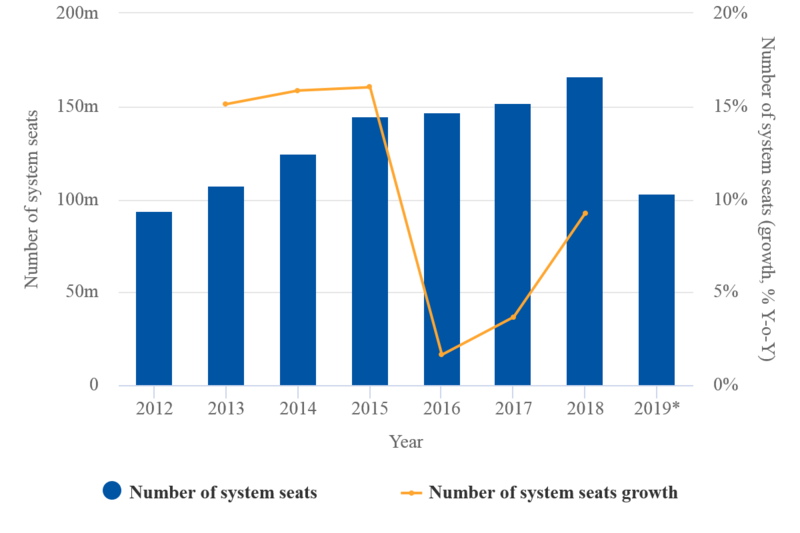 As in 2018, total passenger numbers in Turkey again grew more rapidly than seats in 2018, led by the international market. Total passenger count increased by 11.1% in 2018, the second consecutive year of double digit growth, to reach a new record high of 154 million passengers. International passengers totalled 97 million, an increase of 16.4%, while the domestic passenger count reached 56 million, a much slower increase of 2.9%. These figures confirm a second year of recovery from the 2016 fall in total passenger numbers, which was driven by a slump in international demand in a year of severely heightened geopolitical tension in Turkey. Source: CAPA - Centre for Aviation, DHMI, Pegasus Airlines, Turkish Airlines. Turkish Airlines enjoyed a second year of healthy growth in passenger numbers after the weakness of 2016. Its passenger numbers grew by 9.5%, to 75.2 million, in 2018 (after 9.3% growth in 2017), with similar growth rates in domestic and international markets. Seat capacity was flat and ASK growth was only 5.3%. The improved balance of supply and demand pushed THY's load factor up another 2.8ppts to 81.9% in 2018, marking a 7.5ppt improvement from the slump of 2016 and resuming the previous upward trend path (see chart below). Source: CAPA - Centre for Aviation, Turkish Airlines. Pegasus Airlines' 2018 passenger count was 30.0 million. Its growth slowed to 7.7% in 2018, after 15.2% in 2017. Even in the weak market of 2016 it grew passenger numbers by 8.1%, and 2018 was only its second recorded year of single digit growth. Its international passenger growth continued to be strong, at 12.0%, but domestic growth slowed to 4.7%, from 21.7% in 2017. With seat numbers growing by 6.6%, Pegasus nudged its load factor up by 0.9 ppts, to 85.5%. This was again its best ever load factor and more than 4ppts higher than that of Turkish Airlines (but lower than the 90% plus load factors of Europe's two other ultra LCCs Ryanair and Wizz Air). Note: charter passenger numbers not separately disclosed for 2014 and 2015 (included with international). Source: CAPA - Centre for Aviation, Pegasus Airlines. Turkey's state airport authority DHMI forecasts an 8.5% increase in passenger numbers in 2019 (with the same growth rate in both domestic and international markets); this is slower than 2018's 11.1% increase, but still a healthy number compared with average European growth expected to be around 5-6%. Both of Turkey's leading airlines are aiming for similar capacity growth rates in 2019: 7%-8% for Turkish Airlines and 6%-8% for Pegasus. These are both a little less than DHMI's passenger growth forecast (although the difference is not great), but neither airline expects further load factor improvement. The continued healthy demand environment pushed both Turkish Airlines and Pegasus to another year of increased profits and margins in 2018. Turkish Airlines improved its 2018 net result to a profit of USD753 million, from USD223 million in 2017 (although the group is based in Turkey, its financial reporting focuses on USD). Its operating profit improved to USD1,169 million, from USD794 million in 2017, with revenue up by 17.3% to USD12,855 million. Turkish Airlines' operating margin improved by 1.8ppts, to 9.1%, which was its highest margin since before the global financial crisis in 2009 (when it made 10.9%, the third successive year of double digit margins). Turkish Airlines' 2018 operating margin confirmed its return to the broad range of margins occupied by Europe's big three legacy airline groups, after falling into loss in 2016. It remained short of the 13.2% reported by IAG, but above Lufthansa Group's expected margin of 7.7% and Air France-KLM's reported margin of 7.4% for 2018. *2018 consensus forecast for Lufthansa; IATA estimate for all European airlines. **Pro forma data based on sum of British Airways and Iberia for 2005 to 2008 and supplied by IAG for 2009 & 2010 ( IAG was formed in Jan-2011). Source: CAPA - Centre for Aviation, airline company reports, IATA, Lufthansa Investor Relations (for Lufthansa 2018 consensus forecast). Pegasus improved its 2018 net result to a profit of TRY502 million (EUR88 million), from TRY501 million in 2017. Its operating profit more than doubled to TRY817 million, from TRY405 million in 2017, with revenue up by 55.1% to TRY8,297 million. Pegasus' operating margin improved by 2.3ppts, to 9.9%. This was its highest margin since 2013, but not quite at the 11% level reached in both 2012 and 2013. As noted above, the operating margin of Turkish Airlines often diverges widely from the cycle followed by Western Europe's leading airline groups. However, these results from Turkey's two leading airlines again demonstrate that the two broadly follow the same profit cycle, in spite of their different business models. Source: CAPA - Centre for Aviation, Pegasus Airlines, Turkish Airlines. Both airlines occupy different market segments, in which they each have a unit cost advantage over other competitors. The macro (economic and geopolitical) drivers of the aviation cycle in Turkey are therefore likely to remain key to both.